I recently got a STM32F0-Discovery board. This is a development board that contains a versatile ARM microcontroller and a supporting chip to program and debug the microcontroller. This is Part 1 of a short series to get you up and running with these devices. Microcontrollers are computers that contain a processor, memory and storage all in one tiny package. Such computers are used inside devices that need a small amount of processing power: in televisions, printers, or electronic music players. These computers are easy to program, they utilize little power, and are rugged enough to last many decades of continuous use. I had previously posted a set of tutorials showing how to program ARM processors using assembly. These tiny microcontrollers can be programmed with a subset of the ARM instruction set, making them easy to learn. 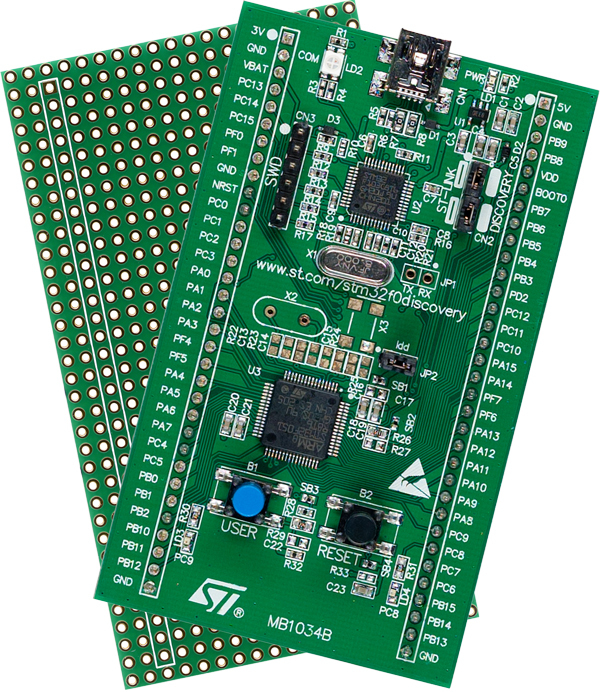 The STMF0 discovery board is a low cost development board intended to demonstrate the advantages of the platform. It looks very compelling: it has many Input/Output lines, it is low cost ($7.50 each), and it uses ARM assembly. Mike Szczys recently wrote a link program that makes this device programmable within Linux. When I received my device this week, I decided to give the Linux interface a try. In case you have one of these devices and an Ubuntu machine: here are the steps you need to follow to get your device working inside Linux. 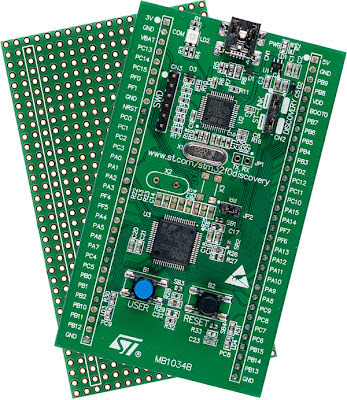 An STM32F0 Development board. At this page, go to Orderable products -> Distributor Availability to find a retailer near you to buy from. A Linux computer with root access. This is code written by Mike Szczys that allows you to communicate with the discovery board in Linux. Checkpoint: You should have two executable files: st-util and st-flash in your directory. They won't do anything yet, for that we'll need device support. sudo cp 49-stlinkv* /etc/udev/rules.d   # Allow any user to access device. This sets up the device so any user can play with it. There is no security issue with allowing users to write to these devices, so the above steps are safe. Chip ID is 00000440, Core ID is  0bb11477. At this point, you have support for the device, but you don't have a compiler or debugger for this board. Your computer is most likely an x86 device so you need a cross compiler to compile ARM code for it. The cross compiler is special: it generates code for a device with no operating system. Code Sourcery is a free toolchain that compiles code for such devices. You can download it for this specific board and install it as a user. You don't need to be root to install it. This is a 100Mb file, so depending on your download speed, this might take some time. You can install it anywhere, the location isn't special. The installer asks you if you want to modify the PATH environment variable. Choose yes. This isn't the only way to get the ARM development tools. If you want, you can compile gcc and gdb from source. Adam Kunen has a long article that describes how to do this. This GDB was configured as "--host=i686-pc-linux-gnu --target=arm-none-eabi". Now, you should have full support to program these devices in Linux and to debug them. Part 2 will show a sample program.